Old or new, short or long, big or small, they represent a growing market for IDI Composites International. IDI has been serving the rapid transit industry for more than 35 years. In the late 1960's, working with the Long Island Railroad, IDI pioneered the use of third rail insulators made from thermoset molding compound. This led to engagement with the New York City Transit Authority, operator of the New York City Subway system, the "granddaddy" of U.S. subway systems. Because it was the nation's first subway system and largely because it was the New York City subway, for decades, most subway systems simply copied New York City's standards and specifications. They were considered to be the toughest standards in the industry. While they are still among the most demanding, many other transit systems, notably Los Angeles, now have equally stringent standards. Moreover, standards are now being regionalized or localized to include special requirements, such as wind tunnel hurricane tests for cities in coastal areas. There are essentially two types of electrified rapid transit systems: overhead catenary systems, which employ a set of overhead wires, and third rail systems, in which a conductor rail, running parallel to the two primary rails, carries the electricity used by the train's electric traction motor. Catenary systems are commonly seen in the Northeast U.S. and cities such as Cleveland, and are also popular in some European cities. Third rail systems require less infrastructure, overhead supports and cables, so are generally more cost-effective than catenary systems. They are also less visually intrusive on the environment. These conductor rails are supported by insulators, which are spaced about ten feet apart, or about 500 insulators per mile of track. Therefore, even a moderate-sized system such as Atlanta's MARTA, with 50 miles of track, would need 25,000 insulators. For the first hundred years, third rail insulators were always made from either porcelain or wood. While they served the rapid transit industry reasonably well in the early years, by the 1960's and '70's, rapid transit engineers were looking for an alternative to help solve the perennial -and related- problems of breakage and cost. Porcelain insulators are inherently brittle, and are easily broken during normal operations. Further, non-operational breakage from vandals is so high that some systems experience more breakage from vandalism than from normal operation. When several insulators become broken, the third rail slips down, causing loss of contact with the metal "shoes" on the train. These gaps in conductivity can cause the train to lose power and stop on the tracks. This "downtime" is not only a huge inconvenience to the system's riders, it is also extremely expensive for the system to get the stalled train operating again and then to physically replace the broken insulators. IDI Composites put its engineers and chemists to work on the problem, challenging them to develop a material that could be specially formulated to meet the requirements of electrified third rail transit systems. The result was IDI's 46-16-60 SMC (Sheet Molding Compound), a highly engineered composite that meets the demanding requirements of the rapid transit industry. High Flame Resistance - 46-16-60 was formulated with very high flame resistance and very low burning time, making it extremely unlikely that an insulator made from 46-16-60 would ignite in normal operations, or that it would contribute to a fire caused by other equipment. High Resistance to Smoke Generation - While small trash fires in subway tunnels are common and specifications demand that, should a fire occur, materials must be flame and smoke resistant. IDI engineers formulated 46-16-60 with special fire and smoke suppressants to ensure that, even in a fire, smoke generation will be kept to absolute minimum levels. Toxicity - 46-16-60 has been designed and formulated so that it does not generate any toxic smoke or toxic gases, either in flaming or non-flaming modes. Compressive & Impact Strength - 46-16-60 has been formulated to provide compressive and impact strengths far exceeding those required for normal operations. Comparative Tracking Index - CTI is used to measure the electrical breakdown (also known as tracking) properties of an insulating material, so it is a critical measure for third rail insulators. Often, parts molded from plastic materials will carbonize or melt during exposure to electrical arcing or tracking. However, IDI's thermoset composites for electrical applications demonstrate minimal effects in these situations and have CTI values exceeding 600 volts and dielectric strength in excess of 15 kv/mm. Additionally, IDI Composites International is the first supplier of thermoset composites to pass a wind tunnel hurricane test. In addition to insulators, IDI supplies material for brackets that support the rail covers that protect people and equipment from contact with the electrified rail. Other rapid transit applications include switches, transformers, contactors, control boxes, traction motor brush holders, and even the seats in the rapid transit cars. As mentioned earlier, IDI first worked with the Long Island Railroad and then the NYC Transit Authority. After that initial success, IDI has expanded its service to the rapid transit market to include systems in Chicago, Los Angeles, Boston, Atlanta, San Francisco, Miami, Washington D.C., and San Juan, Puerto Rico. According to Vice President of Marketing Paul Rhodes, IDI plans to expand its rapid transit footprint in North America, Europe, and Asia. 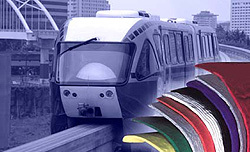 With manufacturing operations in North America, Puerto Rico, the UK, Europe, and China -as well as sales offices throughout those areas and India- IDI Composites International is uniquely positioned to serve the needs of the global rapid transit and light rail industries.